Silver DofE Expedition – During the first week of September we had 2 groups out being assessed for their Silver Expedition. Both successful, these expeditions took place in the “Great Wilderness”. Participant Catherine Wyatt, S5, wrote the following report of her expedition for the Gairloch Times. 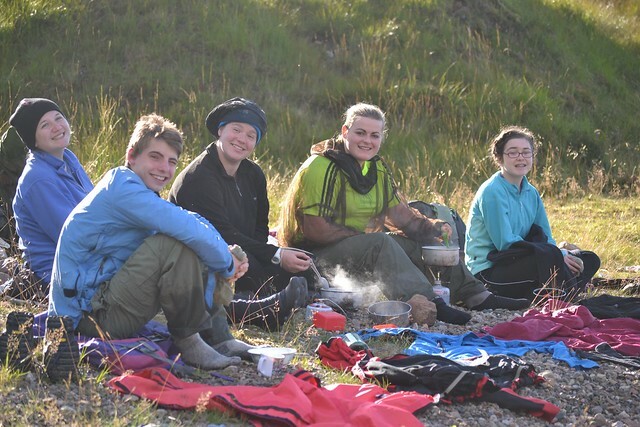 For our three day, Silver Duke of Edinburgh expedition we stayed on local territory, walking from Gruinaird to Poolewe, camping for the first night at Larachantivore and for the second night at Carnmore. Arriving for our first nights camping we became increasingly aware of an ominous black mistiness rolling down the hillside. Tents were pitched and dinner cooked at top speed, to avoid getting caught in the inevitable deluge. The first drops arrived as Innis licked his plate clean, and we dived into our tents not to emerge until the morning. We awoke the next morning to much better weather. However as we progressed to Carnmore we discovered several streams had swollen to abnormal proportions, making the crossings challenging. The highlight of our second evening was the sighting of a shooting star by Ciaran and Innis, the night being clear and starry. 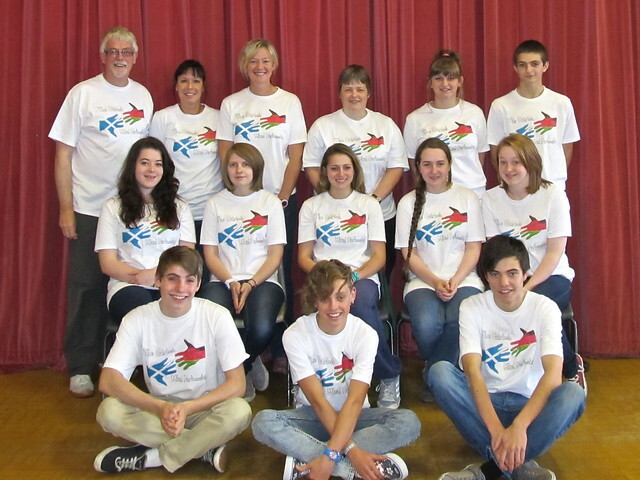 Malawi Update – The fourteen staff and pupils heading for Malawi in October had their final training weekend recently. The group worked on their projects as well as brushing up on language skills. They also covered some more Health and Safety issues. We are grateful to Mr Townsend of Laide Post Office for the donation of insect repellent for each of the travellers as well procuring our mosquito nets. We have also received a contribution of £500 from the Parent Council. On Thursday 12th September a final check took place with the parents. Everything is on track for the trip. The group leaves Scotland on Wednesday 2nd October for Malawi returning on the Saturday19th October just in time to return to school! Ceangal Artists work with senior art pupils – On Wednesday 28th August, 2 Artists from the Ceangal International Artists’ Residency came into school with Ms Gulliver to work with senior art pupils. 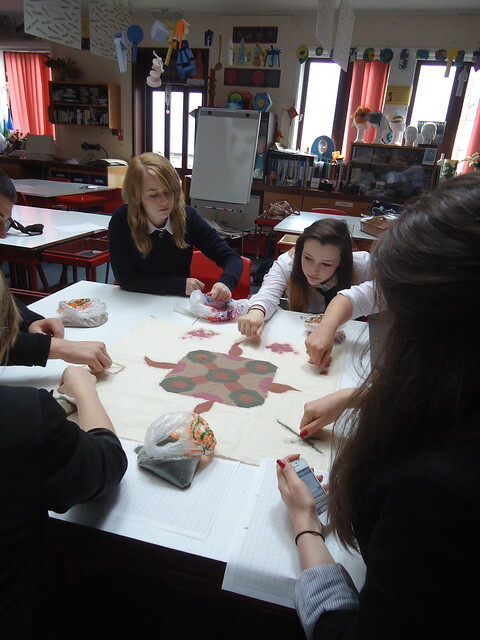 The pupils were learning about some Indian folk art traditions, in particular Rangoli and Henna tattoos. Kiaran and Beena come from the north west of India, but the production of Rangoli takes place all over the country, particularly at the time of festivals such as Diwali, or to welcome guests. Symmetrical patterns are drawn out on the floor, close to the front door or perhaps in inner courtyards. These are filled in by sprinkling coloured powders with the hands. Traditionally rice flour is coloured with such things as ochre and turmeric but these days, many synthetic materials are used, which give brighter, stronger colours. Beena demonstrated with sand from Gairloch beach that had been coloured with Dylon dyes. The pupils had a go themselves and, as with all these things, found the process much harder than anticipated. The pupils then watched Beena produce a design with henna. This is most often done on the hands, either on the palm or the back of the hand and on this occasion, Ms Gulliver was the guinea pig! Henna is a natural dye produced from a plant. It is formed into a powder, mixed into a paste and traditionally it would be applied to the skin with a small stick. These days, however, it can be bought in small convenient tubes, the tops of which can be cut off so that the paste can be squeezed directly on to the skin. Patterns are swirling and intricate and often look quite organic. After being left to dry, the henna can be washed off and the dyed pattern remains below as a temporary ‘tattoo’. The day before a wedding in India, the bride-to-be meets with her friends and female relatives to apply henna patterns to each others arms, feet and legs. Our example was not quite so extensive, but enjoyed by all nevertheless. Many thanks to the Artists and Ms Gulliver for coming into school to share these processes with the pupils. Culture Club and Higher English trip to Eden Court, Wednesday 28th August to see the National Theatre of Scotland/Royal Shakespeare Company Production “Dunsinane” by David Craig – The Higher English class and several Culture Clubbers travelled to Inverness after school to see this excellent production of David Craig’s play about Scotland after the death of Macbeth. Lady Macbeth, Gruach, has not taken her own life after all, and claims she is the rightful queen, so the English commander Siward finds that his mission to restore Malcolm to the throne is more complicated than expected. The theme of the play is about the “impulse to do good which can often end up causing as much or, indeed, more bloodshed” according to the playwright, who wrote the play as Saddam Hussein’s regime in Iraq crumbled, and recognises the relevance his play still has to current events in the Middle East. The strength of the production, however, was also in its mix of strong characters and performances, humour, a striking set design and live music onstage, making it a memorable and thought-provoking experience for everyone. Former Pupil Success – Calum Mackison has been awarded a BSc Hons (2.1) in Audio Engineering by the University of the Highlands and Islands. Well done Calum! Currently Calum is very busy gaining experience as a sound technician in various venues in Perth, and further afield, including Belladrum and the Runrig concert at the Black Isle showground. Important Dates – Also available here on the school website. As we start a new session in school everything is immediately back to full speed. Timetables and courses fixed for senior pupils. Discussions take place with individual staff and pupils about exam results. Some pupils are already planning Duke of Edinburgh’s Award expeditions while others start organising a Triathlon for September in the Harbour area. Settling the new S1 into school is also an important business and our senior pupil mentors play an important part in this process. This summer we have also welcomed several new pupils into the school across S1 to S6 and we wish them all success in their time at Gairloch High School. Exam Results – Once again our school pupils received an impressive set of exam results. Statistically this is the best set of results we have had in several years from S4 pupils in particular. In S5 we have several pupils who achieved 5 Highers with Dux Eildh Maclennan achieving the best results in the Higher category. Ex-S6 pupils Ian Paul and former Dux Fraser Hinchliff both did very well achieving 3 Advanced Higher certificates and an additional Higher. Ian got A passes in all four subjects while Fraser got 3 A’s and a B. 6 pupils in total received a variety of Advanced Higher results. The majority were passed at Grade A including Margaret Mathieson and Rachel MacKenzie in Gaelic (Learners). We congratulate all pupils whose hard work has resulted in such good grades. Meanwhile we do not rest on our laurels. All exam results are scrutinised and areas where results are not as strong as we expect are investigated. Senior Prefects 2013/2014 – Responsibilities of the House Prefects involve: house leadership and motivation of younger pupils, organising teams for sporting events; entertainments; to support and coordinate inter-house events and extra-curricular activities. Kerry House – House Captains Laura Ridehalgh & Peter Banks. Assisted by Gemma McLean & Cameron Moys. Maree House – House Captains Isla MacKenzie & Donald MacKenzie. Assisted by Dannie Bulmer & Chris Young. Tollaidh House – House Captains Caitlin Johnston & Luke Gorman. Assisted by Beth Townsend & Ross Wotherspoon. The responsibilities of Head Girl and Boy Isla MacKenzie & Luke Gorman include: organising and leading Prefects; represent the school at events; organise the Pupils’ Council and homework clubs. Deputy Captains, Gemma McLean & Donald MacKenzie are responsible for organisation and support of charity events; coordination of the pupils involved with paired reading; helping organise scribing and reading for pupil assessments. GWC / Heart Start Aultbea Defibrillator – Before the summer holiday pupils in S1, S2, S4 and S5 were given emergency first aid training by Heart Start Aultbea. It was especially pleasing to see former pupils Bobby Mitchell, the group’s coordinator, and Rebecca Beaton back in school training our pupils. 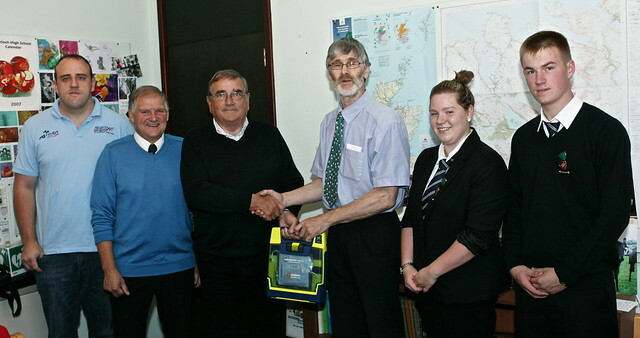 As a follow up to this event, thanks to the efforts of Bobby Mitchell, funding was secured from the Great Wilderness Challenge and Gairloch High School received a defibrillator on Wednesday 21st August. The device will be situated in the entrance hall to the Leisure Centre thereby being available for all users of the school building at all times. Mr Nevis Hulme accepted the device on behalf of the school along with Head Girl Isla Mackenzie and Deputy Head Boy Donald Mackenzie. Also present to handover the device were Bobby Mitchell & Philip Maclachlian, Heart Start Aultbea and Chairman of GWC Eric Thomson. Our thanks to all concerned. When someone goes into cardiac arrest, every minute without CPR and defibrillation reduces their chances of survival by 10%. A defibrillator is a machine that delivers an electric shock to the heart when someone is having a cardiac arrest. 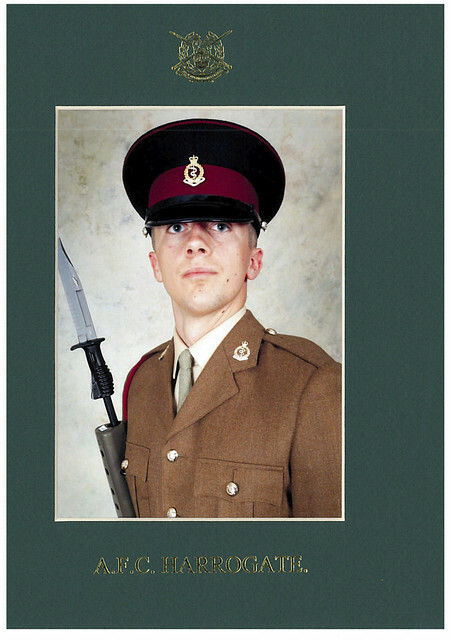 Former Pupil Success – Kieron Morrison has completed phase one of his basic army training. Family attended his passing out parade in Harrogate recently. Kieron has been offered a place in the Royal Army medical Corps. Congratulations Kieron! Kieron was an enthusiastic member of the ATC 832 Squadron and he took part in presentations to S2 and S4 pupils last week to show them some of the opportunities provided by taking part in the local ATC. Click here for information on other former pupils. Malawi Update – Throughout July and August the staff and pupils held a variety of group and personal sponsorship events. They have managed to raise around £4000 as a result of their efforts. The events ranged from a Car Wash to a Music Quiz. Along the way three of the pupils climbed Ben Nevis while others organised tombola, sold tons of cake, tablet and ice cream to locals and tourists alike. We are also grateful to Dingwall Rotary for a donation of £350 and various other donations from families and friends. Our group of 10 pupils and 4 staff will travel to Malawi in the October holiday. Fundraising for the partnership will continue to support return visits for our Malawian counterparts. More details of the trip will be available in the coming weeks but meantime you can watch one of the Ben Nevis ascents on YouTube via the school website or just search for “Ben Nevis climb for Gairloch-Malawi Partnership”. Visit us here – The Gairloch Malawi Partnership on Facebook and feel free to LIKE our page! Our school website area on Malawi features a report on Mr Hulme’s summer visit to Mlozi. New Comenius Project – Members of the community may recall our first Comenius project, when staff and pupils were given the opportunity of visiting Latvia, Germany, Greece and Italy. In addition, we welcomed colleagues and pupils from these countries to Scotland, their visit ending in a superb ceilidh in the village. We have been successful in securing funding for a 2nd Comenius Project, which will run from now until July 2015. The countries involved this time are: Latvia, Poland, Finland, Spain, Portugal, Greece and Turkey. This is an exciting opportunity for our staff and pupils to link with communities throughout Europe. Our first trip is to Latvia in November; further trips and events will be reported as they develop.